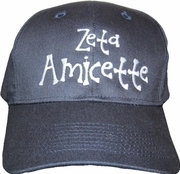 Whimsical and fun letters adorn this twill cap so cute! Features an adjustable Velcro closure. Advisor's hat will have the word "Advisor" embroidered underneath existing lettering.